The Best-1 large-capacity 72 oz. 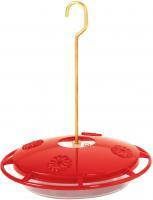 feeder is a hangable hummingbird feeder that showcases Best-1's durable design and construction on a massive scale! The 72 oz. feeder is insect-proof, easy-to-clean, and features eight feeding ports with a built-in perch to accommodate multiple hummingbirds at once. Perfect for enthusiasts with a large number of hummingbirds in their gardens who don't enjoy refilling their smaller-scale feeders so often. When you have a lot of hummingbird traffic, you need to come prepared if they're going to stick around--so give them the best with a Best-1! I have over 50 hummers each year and the 8 cups of liquid each holds. Not good for sunlit area as the plastic darkens and gets brittle. Great feeder. great company to do business with. This is my second shipment. Hold lots and easy to clean. Love this feeder! Great size and quality. 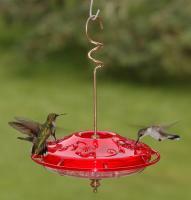 This is the best feeder that I have used for hummers. In the summer I will typically go through 25 lbs of sugar per week. Big enough for large number of birds at one time. Its huge and I have 4. Only have to fill every 5 days. That's filling all 4. I go through 25 pounds of sugar a month for hummers alone. 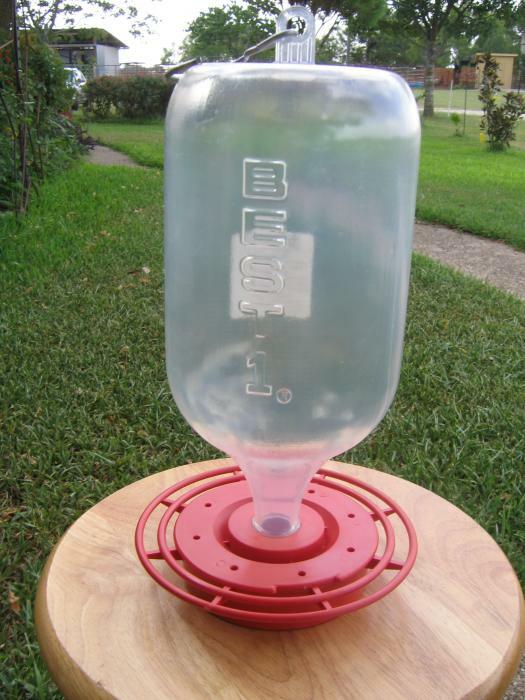 Due to the high Hummingbird traffic around my office, I tried the 72oz feeder. It's great! 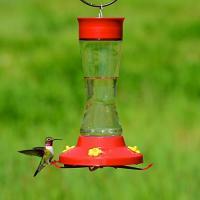 The 72oz feeders work great in locations where large populations of hummingbirds migrate through each spring and fall. These only need to be filled once a day or every two days. Cleaning is easy but filling the small opening requires a funnel or narrow stream pitcher. These feeders are ideal here in the east mountains where humming birds are abundant. I have a lot of hummingbirds, and go through a lot of nectar. I began looking for a large capacity feeder so I would not have to fill them every day. I didn't want to risk the hummers running out of nectar while I was at work. I purchased two of the Best-1 72 oz feeders in June. Initially, I just hung up one, replacing a favored feeder of the hummingbirds. They found it immediately. I now have my my 2 72 oz feeders hanging from the eave of my home. The hummingbirds prefer this spot for feeding. I only have to fill these 2 feeders every other day. The only concern I had, was a brush that would reach the bottom of these feeders, but a friend sent me a brush with an 18" handle that does a super job. Cleaning is very easy for the base that comes totally apart. Most of my nectar feeders hold only about 2-4 cups of nectar. My two Best-1's cut down the time I have to spend cleaning and refilling. I highly recommend this feeder for those who get a lot of hummingbirds and are kept busy refilling them. The quick service and prompt delivery made me a satisfied customer for your website! 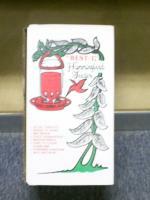 "Best 1" brand hummingbird feeders are just that, the best! They are easy to fill and more important easy to clean. I have sold and used many other kinds but these are the best. I now have 8 of the 72 ounce hummingbird feeders. They are time savers when you have as many hummers as we do. It is easy to clean and fill. I gave it as a gift and she loved it! Over the years, I have tried all sorts of hummingbird feeders. The Best-1 feeders really are the best. They are the only ones I use. Since I live in the mountains of Colorado I have many hummingbirds visit my feeders. This larger capacity feeder is every bit as good as the smaller one. I even purchased some for my friends. When anyone asks me about what feeders to get for our local hummers I only recommend the Best-1 feeders. I'm very pleased with the hummingbird feeder! We will be ordering more in the future. It is very easy to keep clean and it doesn't need filling every three days and that's a definite plus! It is great and will come apart easy (Base) for cleaning!!! I'd been looking for a larger feeder since I have so many hummingbirds. This is a great feeder! 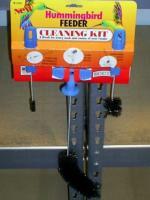 This feeder is very easy to clean. It is important to clean every inch of the feeder. The way this feeder opens up you can see every part and keep it clean is unique. I also like the fact that it comes in several sizes. I have a lot of birds and the 72 ounce size lasts a whole day. I have several of these and love them. I have bought several of these over the years. I have hundreds of hummers each year in my garden. I needed something large enough so I didn't spend my life refilling nectar jars. These are great. That being said, the bottles are plastic and grow brittle with exposure to sunlight. I place mine up under the eves in our old house where no sunlight can reach them. Also, we have stone floors. If I drop one of the bottles, it WILL break. I have been very pleased with my purchase. One other not is cleaning. It is almost impossible to get a brush done inside of them. I soaked mine in a solution of Hydrogen Peroxide and some Clorox. Be sure to rinse many times before using!!!! The products were great. The only problem was there were no instructions on how to properly hang the protector from ants along with the feeder.I had to make a phone call to find out. I liked the feeder because it was a large one. I have lots of birds and they empty the quart ones sometimes 3 times a day. The only thing I didn't like was the small neck made it hard to clean on the inside. I have brushes and did manage to clean it. The order was just fine but a little pricey for what I got. I sure would love to find the kind I just wore out, they were a lot better for less $'s. Excellent! I have used the same feeder before. It could be improved by using a 5" hose clamp and a bail. From experience the plastic part on top will break after a year or two. I like the size of the container but it seems to airlock quite often. I go out everyday and tip Ito let the nector down into the bottom. I like the 72 oz. feeder very well! The base is very easy to clean and the bottle however could have a larger opening for easier cleaning.